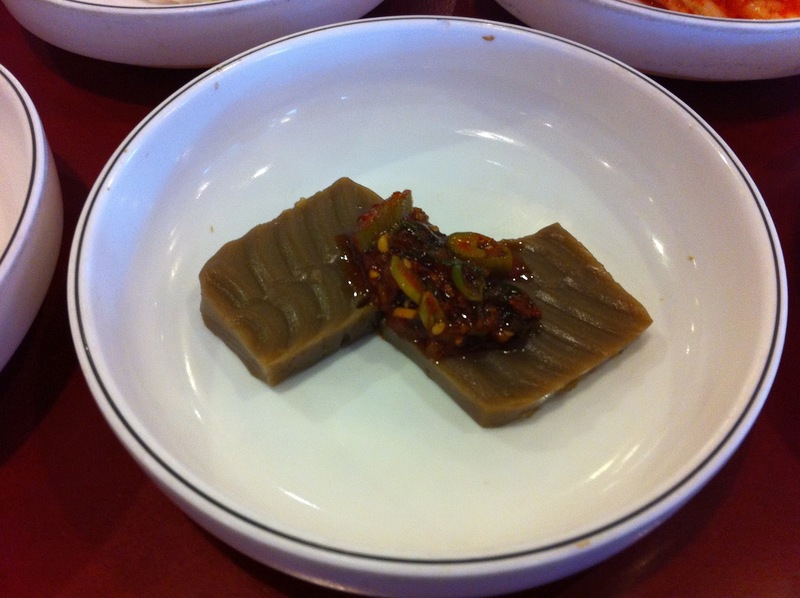 In one of the summer editions of Atlanta magazine, they named Myung Ga Won as one of the fifty best restaurants in Atlanta. One day last week, I was heading out to lunch alone and thought I’d give it a try. 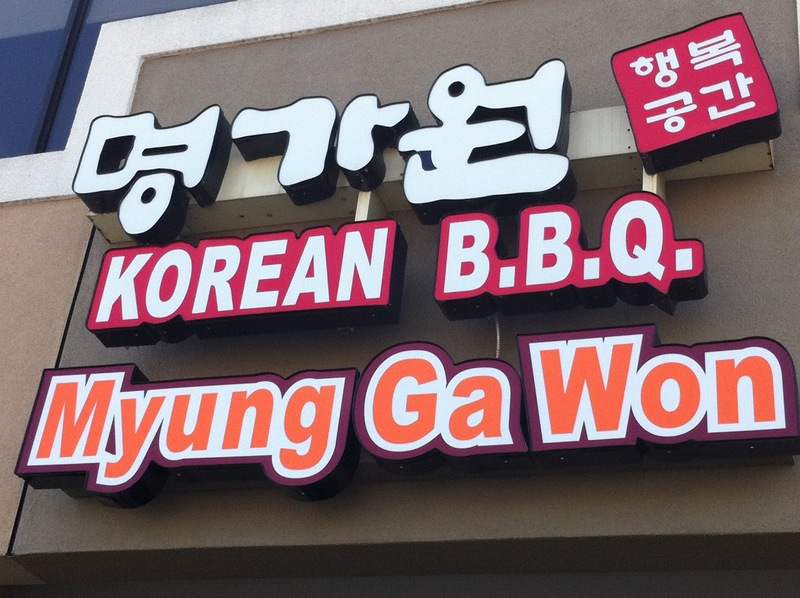 Walking in was just like going into Moe’s, except that everyone yelled at me in Korean. I’ve been assuming it was “hello and welcome”….. The menu had big Korean characters, small English descriptions and pictures, but I couldn’t make heads or tails of what I wanted. The second waitress was able to understand that I was clueless on the menu and made three recommendations by pointing at different combos. 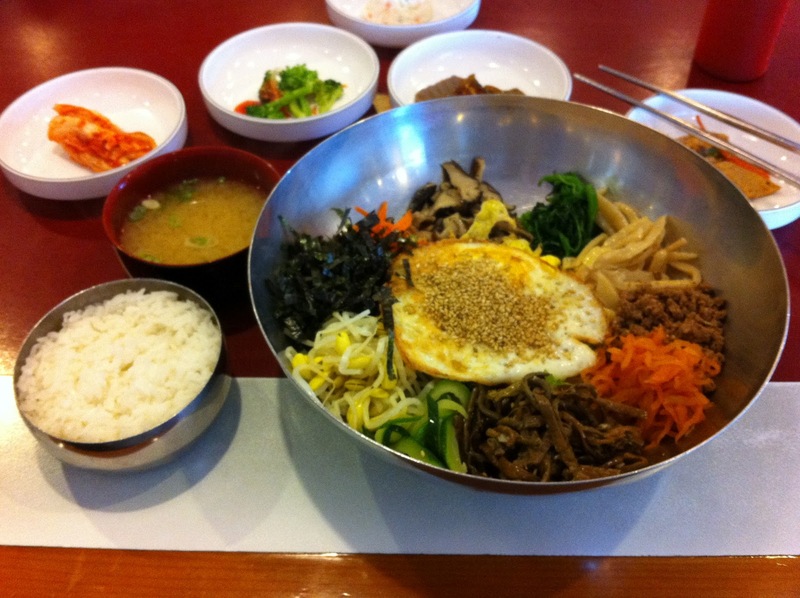 I chose what I have since found to be bibimbap, which was described as “meat, rice, vegetables, pepper paste”, with salad and appetizers. First to arrive were the five appetizers. I have now identified four – I didn’t photo the fifth, but I can best describe it as looking like KFC cole slaw, without the orange flakes, and scooped out like ice cream. I chose not to try that. 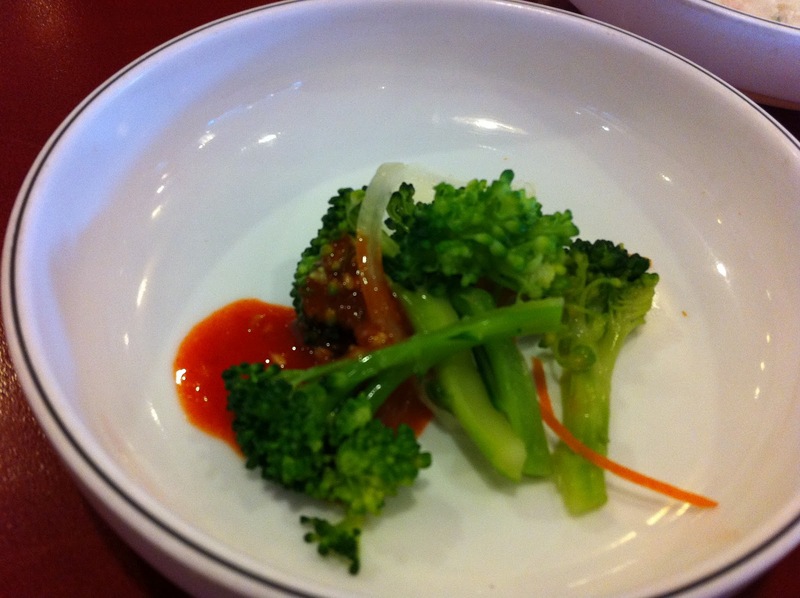 I knew I wouldn’t like the broccoli, mainly because it was broccoli. 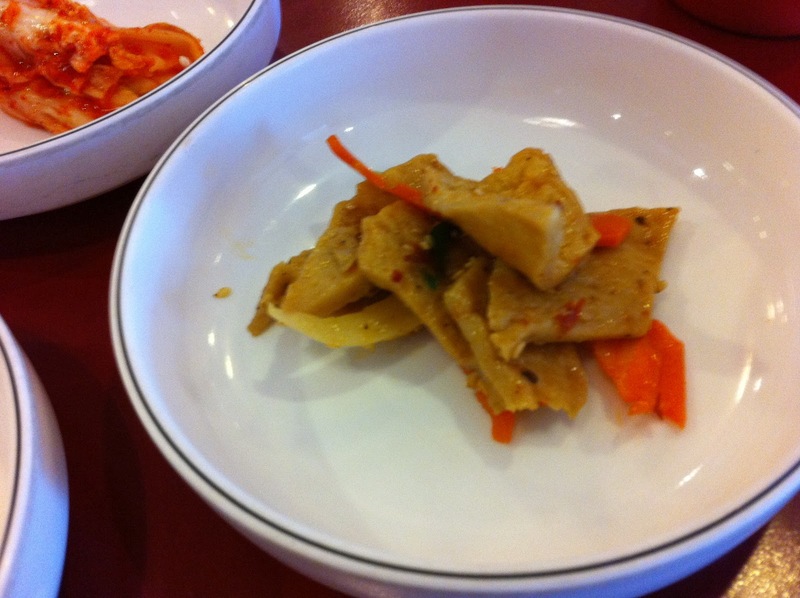 This one looked like the chicken from Mongolian chicken, but had the texture of tofu. One bite was enough. That one was kimchi. 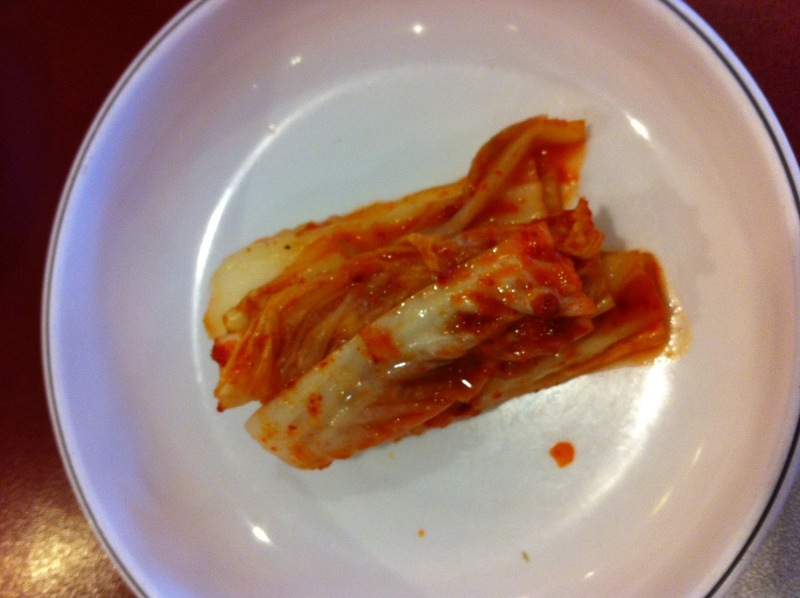 I’ve hated kimchi since my first encounter in the late 80s at Mirror of Korea, down town. This one baffled me. I couldn’t figure out the taste, but it most closely resembled the taste of dirt. I ended up with a third waitress trying to explain, who used a series of hand gestures (tree + making a small “o” from her thumb and index finger) to play a form of charades that ended up with the winning word – “acorn”. It was acorn jello, which explains why it tasted like dirt. Then came the bibimbap. It was a 10″ silver mixing bowl, with lettuce in the center, topped by a fried egg covered with sesame seeds, surrounded around the bowl by sliced mushrooms, sliced carrots, tofu, black noodles, ground something, cabbage, peppers and a couple of other things. Accompanied by a bowl of white rice and a cup of soup. I tried to eat the beef + the rice + the sauce with the chopsticks and flung food over the place. 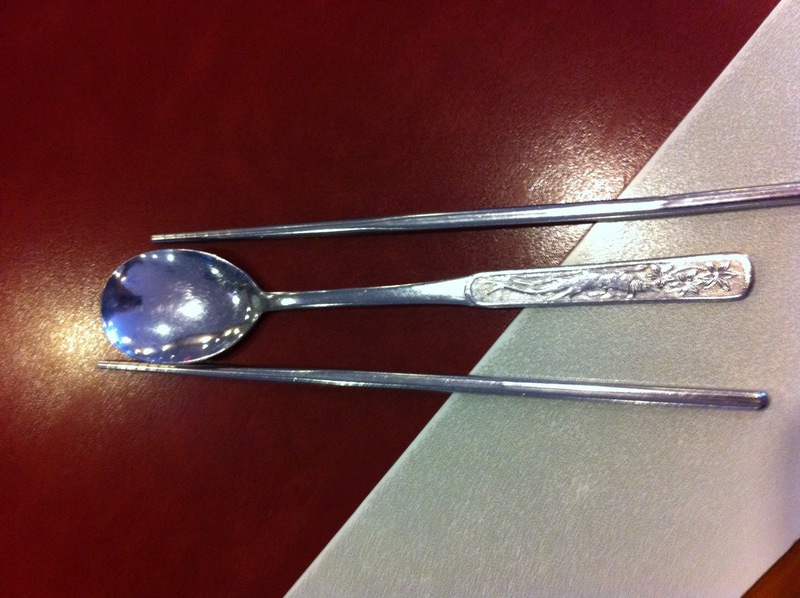 The waitress, having pity upon me, walked over, made the universal sign of “need help, you dolt?” and took the bowl, the giant spoon, a squeezee bottle filled with spicy red sauce, and started mixing. She’d stir, squeeze in red sauce and repeat. She handed me back a bowl full of rice with all kinds of stuff mixed into it. I’ll have to confess, I picked out the fried egg and ate the rice. Then I drove through Wendy’s for a wrap on the way back to the office.